General Hospital (GH) spoilers update for Thursday, November 30, tease that Oscar (Garren Stitt) will decide he’s had enough. Kim (Tamara Braun) constantly avoids his questions and shuts down discussions. Oscar will finally decide to just blurt out how he feels. He’ll declare that he can’t stand not knowing who his father is. Oscar will push Kim to be straight with him for once. Elsewhere, Carly (Laura Wright) will rant about Josslyn’s (Eden McCoy) bad behavior. She’ll ask why Joss keeps sneaking off without warning. Carly won’t understand what’s gotten into her daughter, but maybe Joss can wiggle out of a harsh punishment. She might get a lighter sentence if Carly hears about hunt for Oscar’s father. In Havana, Jordan (Vinessa Antoine) will continue to guilt trip Andre (Anthony Montgomery). She’ll insist that this is his chance to make things right. Jordan will hope that Andre can prove he’s got a good heart under there. Fortunately, General Hospital spoilers say Andre will indeed come through for Jason (Billy Miller) and Patient Six (Steve Burton). Back in Port Charles, Franco (Roger Howrath) will have a major outburst. It sounds like Liz might shift her allegiance to Patient Six for a moment. She might hint that she understands his perspective. Franco will freak out and demand some answers. He’ll wonder why Liz is on the wrong side, but she’ll just get suspicious thanks to his over-the-top reaction. 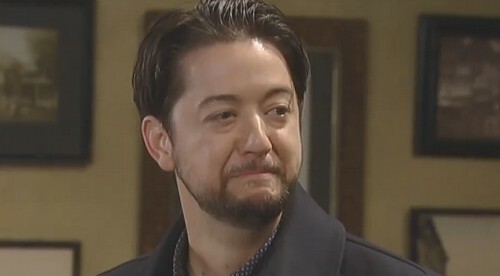 Spinelli (Bradford Anderson) will get the opportunity to pick a side as well. After he looks Patient Six in the eyes and hears that familiar voice, he’ll be completely sold. Spinelli will immediately offer assistance to his friend. General Hospital spoilers say P6 will certainly appreciate the extra support. Across town, Jason and Sam (Kelly Monaco) will talk about their weird visitors. Kim had to drag Josslyn and Oscar away from that strange conversation. Sam will ask if Jason figured out how he knew Oscar’s mother. He felt like he’d seen Kim somewhere before, but he couldn’t quite place her. Jason still won’t have a clue, but the mystery will continue to unravel. Meanwhile, Dr. Obrecht (Kathleen Gati) will be as shifty as ever. She’ll flash an evil grin as she speaks to Patient Six and Sonny (Maurice Benard). Dr. O will reflect on Jason Morgan’s sought-after skills, but she may not have any details about Faison (Anders Hove) or the kidnapping. GH fans know how much Dr. Obrecht enjoys stirring the pot. She can’t be trusted, but that doesn’t mean she’s in the loop on the memory mapping scheme. Sometimes the twisted doc just likes to mess with people. Regardless, Sonny and Patient Six will get closer to the truth soon. We’ll give you updates as other GH news comes in. Stick with the ABC soap and don’t forget to check CDL often for the latest General Hospital spoilers, updates and news.